Virtually all of the socio-technical systems that maintain public order, quality of life, and commerce depend on a reliable electric supply, and critical infrastructure failures such as 'blackouts' have profound implications for citizens and for those who govern in their name. Social scientists have noted the impact of such failures on society, and undertake the study of crisis management to improve our knowledge of why critical systems fail and how such systems can be made more reliable. Auckland Unplugged is a major contribution to this field. Using the 1998 blackout of the central business district of Auckland, New Zealand, as a case study, the authors reveal a number of important insights into the central challenges of crisis governance in post-industrial, democratic societies. These challenges include finding an appropriate division of responsibility and labor between public- and private-sector actors, crafting and coordinating a crisis response that addresses perceived threats to community values and avoids the twin perils of underreaction (e.g., passivity or paralysis) and overreaction (e.g., 'crying wolf' or political grandstanding), coping with competence/authority discrepancies under stress: Those who have expert knowledge of the technical issues rarely have the authority to make policy; those who have the authority generally lack the technical expertise to comprehend the subtleties and uncertainties of the issues at stake, maintaining credibility and legitimacy when facing acute, ill-structured problmes in politicized, publicized, and highly uncertain environments. Such challenges are by no means specific to Auckland or to the problem of coping with urban 'blackouts.' 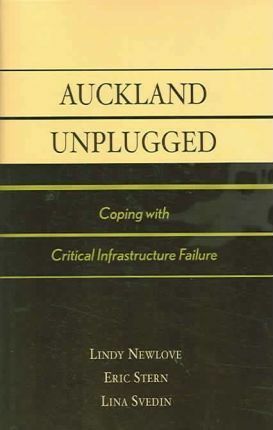 Auckland Unplugged clearly describes and carefully explores general and recurring problems faced by crisis managers around the world.